The chart below is from a recent Nate Silver New York Times blog. 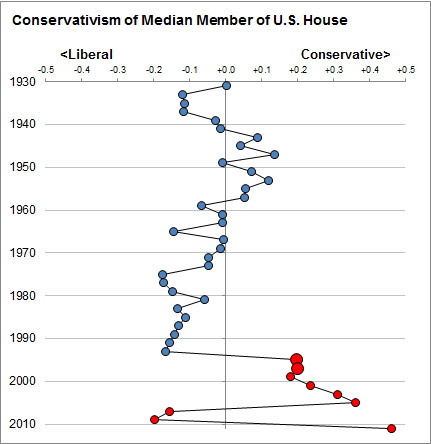 It plots the median DW-Nominate score, a measure of how liberal or conservative a House member's voting record is on economic policy, for House of Representatives sessions over the past 80 years. On the other hand recent Democrat controlled sessions are right in line with historical trends. For 80 years the mean DW-Nominate score for House sessions has trended slightly toward more progressive values. Draw a line from the topmost point to the next to last point, the most recent session controlled by Democrats, and it passes right through the heart of the data points for all House sessions, Democrat or Republican controlled, except the outliers representing Republican sessions since 1995. Panderbear concludes from this chart that Republicans have changed radically. Eisenhower era Republicans, not to mention Democrats, look like socialists to today's Republicans who have veered dramatically, pathologically, and dangerously to the political right, while Democrats have continued to follow historical trends. One result of Republican radicalization is that changing the party in control of the House of Representatives now has an unprecedented jarring effect on legislative continuity. The two parities are so far apart that the nation suffers from political whiplash whenever the House changes hands. That can't be good.